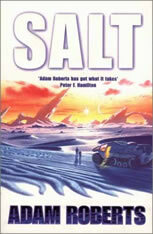 Adam Roberts' first novel Salt is an exciting political thriller set within the science fiction genre. The writers at Paper Masters will custom write any project on any novel you need. When looking at Salt, by Adam Roberts, our writers would explore the novel in the context of its science fiction genre and in light of how the Senaar and the Al regard life. Adam Roberts' first novel Salt is an exciting political thriller set within the science fiction genre. A disagreement among Earth colonists during their journey to a new world gradually turns into a bitter feud that persists long after the establishment of new space colonies. Over time, the colonists divide into two warring factions, the Senaar and the Als. Salt was first published in 2000 and the novel won substantial critical acclaim. It was nominated for the Arthur C. Clarke award in 2001. Each of these characters represents one of the feuding settlements. Barlei is a dictator-like military official who supports the rigid authority of the Senaar colony. Petja is an anarchist who defends the Als from Senaar aggression. Gradually, Petja is transformed into a terrorist as a result. Through the use of these two characters, their private stories and public personas, Roberts provides two competing interpretations of the cause and purpose of the ongoing war. Both sides feel justified in their increasingly violent behaviors. Emulating real-life political disputes, neither side is entirely correct and neither side is innocent of wrongdoing. Fans of science fiction will appreciate Adam Roberts' decision to not select a clear villain or hero for Salt, leaving the interpretation to the reader. The Dispossessed- The Dispossessed Research Paper by Ursula LeGuin is an exploration into a utopian society. George Orwell’s 1984 - George Orwell’s 1984 book reports discuss one of Orwell's best known dystopian science fiction novels. The Time Machine - The Time Machine research papers examine the science fiction novel by British writer H.G. Wells. Paper Masters writes custom research papers on Adam Roberts' first novel Salt and discuss the exciting political thriller set within the science fiction genre.